while the field conditions are adjusted to yield the desired terminal voltage at a given load. In a motor, on the other hand, the need is to match the speed-torque characteristic of the load and run the load at a specified speed or speeds by adjustment of the field and by adjustment of the armature voltage in case speed control over a wide range is desired. and the magnetization characteristic of the machine with the proviso that the armature reaction will cause a reduction in flux/pole. DC motors are of three types according to how these are excited. In a motor the shunt excitation is not dependent on the armature induced emf and is independently governed by the supply voltage. In this regard shunt excitation of motor behaves more like separate excitation and not like self-excitation as in a shunt-excited generator. We shall now consider the operating characteristics of the three types of motor. 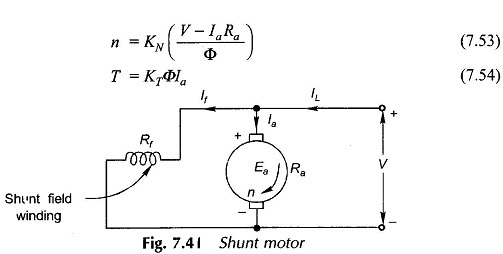 Figure 7.41 shows the connection diagram of a shunt motor. Its operation with a fixed terminal voltage and fixed field resistance, i.e. with constant shunt field current will be now considered. Variable Rf and V operation will be discussed in Sec. 7.13 on speed control. Equations (7.53) and (7.54) yield the variation of motor speed with armature current and with torque as plotted in Figs. 7.42(a) and (b). These characteristics can also be plotted with respect to line current by merely adding the field current (//, = /a /f). It follows from Eq. (7.53) that speed will fall off due to armature resistance drop /„Ra but this is countered by a decrease in 0 caused by the armature reaction. Since IaRa effect predominates, the speed falls somewhat with load as shown in Fig. 7.42(a). As per Eq. (7.54), but for demagnetizing effect of armature current, the T-Ia characteristic would be straight line slightly sloping downwards. The actual torque characteristic is somewhat higher and bends inwards due to reduction in flux/pole as shown in Fig. 7.42(a). no-load to full-load by a few per cent; in fact the speed remains substantially constant. Such a characteristic is known as the “shunt” characteristic. An important class of ac machine, called the induction motor, also possesses a similar (n-7) characteristic.